! This is NOT a method of direct communication with FLOWERS AND MORE for purposes of ordering or rectifying problems. They were at my employment early and the flowers are amazing. I highly recommend this flower shop. So beautiful. The arrangement was very nice. Looks so fresh and green. Thank you so much and glad you enjoyed your flowers. I am very happy with the arrangement that was sent. It was perfect and beautiful. I live very far from the florist and my recipient, so being able to trust the photos online to accurately portray what will be sent was crucial. I would definitely recommend this florist. I could not have been more pleased with the bouquet that was delivered! It looked picture perfect! This is the first time that I've ever ordered from a flower shop that actually delivered what they said they would! Will definitely order again from here! I was pleased with everything. My sister loves bed the arrangement. Thank you! Beautiful arrangement. Still looking fresh after 4 days. Gorgeous arrangments beautiful long lasting flowers, can always count on Robyn to do her thing and get it done right! Great shop in North Fresno; prices are great for all that you get. Order and delivery went smoothly, twice, and my mom loved her mother's day and birthday bouquets. From her pics, they are full and brilliant and lasted more than a week...she was able to extend that time to a couple weeks by subbing in a few fresh flowers from her garden at the end. Highly recommend. We ordered flowers from Alabama for our mom’s 70th birthday in Fresno. We couldn’t make it home but your flowers made it to her surprise party on time and were simply beautiful!! Thank you for being there for us when we couldn’t. Wonderful service and wonderful arrangement! Best flowers I have had in years! I would definitely buy flowers from Flowers and More again. Thank you so much! I just called in this morning, and within 2 hours The Most Beautiful Bouquet of Flowers was Delivered as requested! You have a New Customer!!! always such a Great Job, delivered when requested and BEAUTIFUL just like the picture ... i have never been disappointed. Absolutely beautiful arrangements. I have oredered online a few times. Very satisfied with the quality of flowers and beauty and uniqueness of the arrangement. Would definitely order local flowers from Flowers and More again. Thank you! The website was easy to navigate and the plant I ordered was delivered prompt. The arrangement was beautiful. Lovely choice of flowers and color blend. It stayed lovely for many days! I will definitely be using Flowers and More again! Excellent service and quality!! Very pleased with substitutions of flowers for the arrangement. Not quite what I expected, but pleased. I ordered flowers on their website to be delivered same-day to my girlfriend and within 3 hours she was raving to me how excited and happy she was! I am a customer for life because of the great customer service you have provided! We are so glad to find a great florist that services the Western side of Fresno! The funeral arrangement was beautiful, and much appreciated. Thank You. Received for my birthday and they were BEAUTIFUL!! Thank you, my Mom loved her flower arrangement! The flower arrangement was absolutely perfect! It was just what I asked for. Thank you so very much. I will certainly use your services again! I had flowers sent to my daughter for her birthday (ordered and delivered on the same day) and they were absolutely beautiful and very colorful. She loved them! I would highly recommend Flowers And More! Outstanding service and you exceeded my expectations. I placed my order from Texas for my parents in California and the.arrangement was GORGEOUS!! Thank You A Million times! I ordered an arrangement for my mother in the morning and by the early afternoon it had been delivered. It was perfect and beautiful! I would definitely use this florist again. Beautiful flowers!! I usually buy flowers from D&L every year for my parents anniversary but never again!! They do such a crappy job and not worth the money. I wanted to try somewhere different and after reading reviews I chose Flowers and More and so glad I did!! They put thought and consideration in the arrangements. The people there must love there job because it showed. I'm very pleased and to see my mom's face PRICELESS!!! Ordered flowers that were delivered same day in amazing presentation and quality. Thank you!!! Flowers looked amazing and lasted well after they were received. My girlfriend LOVED them so I will definitely buy her flowers from this florist more often. I ordered flowers for my 90 year old Aunt who lives in Fresno. She was so happy with the arrangement and my cousin sent me a picture of my Aunt with her flowers. They were so beautiful and a huge arrangement. It really made her happy, and me too! Thank you so much! I ordered Flowers for a friend, I live in a different city and wasn't familiar with this Florist. The web site was easy to view, ordered online and was told the arrangement was well done. Excellent service, called to let me know of some substitutions and delivered same day. Absolutely beautiful flower arrangement. Your website was so easy to use and order from. The plant was beautiful! Thank you for such great service. The lovely bouquet I ordered arrived on time and my friend was thrilled. It was gorgeous. Will definitely use Flowers and More again and again! This was the most beautiful arrangement I've ever received or seen. Thank you so much for your amazing work and service. If I need flowers in the future, I'll definitely order from you. I'll recommend you to everyone I know. Thank again! I received followers from your business before and was always impressed. I love your arrangements! I only use your services when I send flowers. My sister loved the flowers. She sent me a picture and they are fantastic. The colors are so vibrant. Very happy. 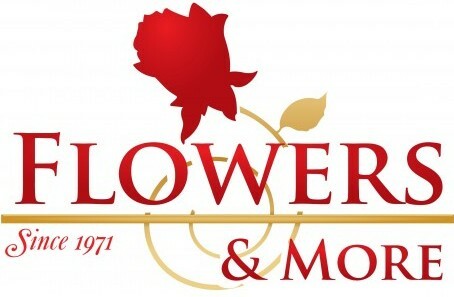 Loved, loved, LOVED the flowers I ordered from here! The bouquet was sent to a dear friend, and it exceeded all expectations. It was beyond gorgeous, huge, and so artistically crafted together. Instead of a typical, slapped together bouquet, it was organized and pieced so well!! My friend received non-stop compliments about the beauty and colors of the bouquet. I will always be using Flowers and More from now on for all my florist needs. Thank you for making someone's day perfect! The flowers were great. Most notably, I left an order comment that three bouquets for three different recipients in the same house would get the delivery simultaneously and the request worked out. This was different from past orders. I do wish I could get a smaller/more precise delivery window so that I could better plan my day. I am your mailman and I have ordered from you gals in the past. Never ordered roses from Afghanistan before but once my wife told me she loved them I knew she would. Thanks again. They were difficult to reach by phone and their delivery tracking system is arcaic. My wife's flowers did not arrive until 4:30pm on a Friday. When I called they didn't apologize and just said we didn't know she wanted them early in the day. They said if I wanted them early I should have more for delivery. I haf already paid the $15 fee which is already high for a deliver that was only 5 miles from their store. My grams was VERY HAPPY with her floral arrangement from the Fresno Florist! It was delivered on time and looked beautiful (so she told me - my grams doesn't have a camera phone lol). Thank you so much for offering this delivery service since I am far away from home! We were very happy with our tropical flowers. There were more flowers included than pictured in the brochure. Glad I found you. My daughter ordered flowers yesterday for my birthday. Not only were the flowers delivered per her instructions, they were absolutely a beautiful arrangement. Coming in my office this morning, they still look like they were just delivered and are still very fresh. Most flowers sent to me in the past already look dead the next day! Fabulous flowers and will give positive word of mouth when asked where to purchase flowers from! The Flowers looked great, she loved them. Thank you for the wonderful service Flowers and more By Gemma. Thanks for taking the time to review our business. We really appreciate it. Thank you for your amazing customer service and your gorgeous arrangements! I had the best experience calling Flowers and More today. I was on their website and called to asked if I order on the website today would it be delivered tomorrow. I spoke to Amanda and she said she could take my order over the phone and have it delivered today. She gave great customer service and made the whole experience very easy. Thank you, a satisfied customer. Delivery was not prompt - arrangement was just OK - not anything impressive for the price.....disappointed. Always a perfect arrangement for my mom. Thank you, Robin, if you prepared it. I visited my mom recently and didn't realize that you are right next door to her retirement apartment. Great work. My mom absolutely loves every arrangement you have made for her. It is the bright spot in her retirement apartment every time I send flowers to her. Thank you. Excellent! The long stem roses are beautiful and the service was Excellent! Thanks Robin! family said they were just beautiful. Robin and her staff made the most beautiful arrangements for my Mom's funeral service. Everything was more than perfect. We would recommend them to anyone. Their prices were very reasonable, also. Flowers for my mom's new apartment. She absolutely loved them. I let you handle the design. Only one problem: The arrangement was so large, she had trouble lifting it. she is 92 years old, but somehow was able to get it to the sink in a couple of days to change the water. Flowers stayed beautiful for over a week. Thank you for a really nice job. I'll be back in a few weeks for Valentine's Day. They're gorgeous, thank you! Never had seen such large rose buds ever! Flowers are beautiful! Still look great after 4 days! LOVE LOVE LOVE this place! The girls are always friendly, polite, and eager to help me create beautiful arrangements, even on a tight budget! Flowers are amazing, and the arranging is the BEST! Great prices, service, and flowers. I never go anywhere else! All it's perfect, thank'you from Italy. My niece liked the live houseplant she got. The flowers were beautiful! Nice work as always!! Easy to follow website, item sent straight away. Fantastic service!!! Will def use again! Many thanks!!!! The colors were brilliant and thankfully NO baby's breath! The flowers were spectacular. However, even though I placed this order two weeks in advance, the web site delayed the order so that Gemma had to rush, completing the delivery at 9PM. If timing is important, telephone the shop directly. Ordering online was very user friendly. The prices were just right and I was able to order for same day delivery. The flower recipient said it was the most beautiful flower arrangement she has ever received. Thanks F & M! I have requested Robin to write a message in my language like what I have sent her for the arrangement and she was happy to do it. FLOWERS & MORE BY GEMMA is the best service in town with very reasonable price that I can trust after ordering online several times from far away. Fantastic work! Your service was excellent! Awesome arrangement and delivered promptly! Thank you so much!!! This airtlce is a home run, pure and simple! Oh...your flowers very very nice . FLOWERS & MORE BY GEMMA you are no.one in fresno. Very easy to order online and delivered on the same day. I found my new florist shop and will definitely be using this shop in the future. Very unhappy with service. Went into store several times for prom flowers. Was put off due to Mother's Day, and instructed to come when shipment came in. Shipment came in and no flowers for prom, had to go elsewhere. I feel they only want customes with large orders. They could have been our family/local flower shop, not now. Flowers and More continually provides gorgeous arrangements regardless of the size or formality I am needing. In addition to their reliability and creativity, they are a kind-hearted and thoughtful bunch. I can't imagine recommending anyone else. I ordered the flowers in the morning for same day delivery, and Gemma came through for me! I appreciate the fast service! Most important of all, the flowers were beautiful! The recipient phoned me and sent me photos, overwhelmed by how beautiful the arrangement was! Plus, some of the flowers continued to open during the following week, making the arrangement more beautiful every day! I called on a MONDAY and ordered a birthday arrangement to be delivered by 9:30 am on Wednesday morning. The flowers were not delivered until 12:30! I am very disappointed in the service I recieved. WILL NEVER USE THIS PLACE AGAIN! They did great jos from start to finish. Beautiful arrangement, all very fresh! Everything was great. Ordering was easy. The person that passed away was from Hawaii and after I ordered the flowers I thought it might be a nice touch for the family to include the Hawaiian state flower. So I called the shop and found out that they didn't have that flower but she had some other Hawaiian flowers. I explained the situation and she said she would add some of the Hawaiian flowers to the bouquet I ordered and make them the centerpiece. I really appreciated her willingness to adjust and to make it nice for the family. The family said that the flowers were beautiful and that they had included 2 of his favorite Hawaiian flowers!! Great job! I will definitely use them again and would highly recommend them. Thanks again! It was Valentine's weekend and a dear friend ended up in the hospital. They were delivered the same day we placed the order. More importantly a few weeks, later we were in town and the family said the flowers were doing well and cheering him up in the hospital. WOW! We were happy!